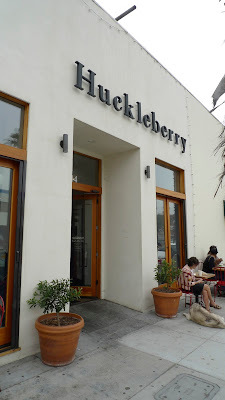 I've been meaning to check out Huckleberry Cafe for awhile, so when I went home to LA last month and my friends wanted to meet up for brunch, I figured it would be the perfect place to meet. Huckleberry Bakery and Café is owned and operated by husband and wife team Zoe Nathan and Josh Loeb. Zoe learned to bake at Tartine Bakery in San Francisco, which is one of my favorites. Josh opened Rustic Canyon Wine Bar and Seasonal Kitchen in December of 2006, which is where they both met and eventually fell in love. 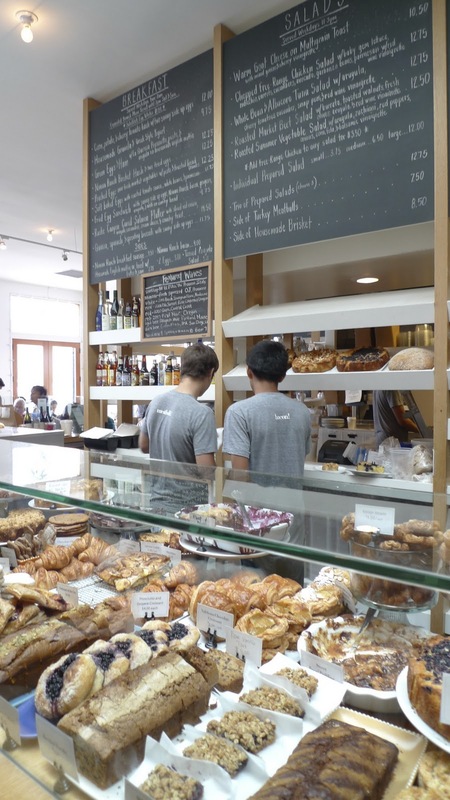 They wanted to open up a local artisan bakery and cafe where friends, family and enthusiastic food lovers could come together to eat delicious homemade bread, pastries and savory food in a warm casual atmosphere. Huckleberry Cafe is definitely warm and inviting and if the lines out the door are any indication, I think they have succeeded. 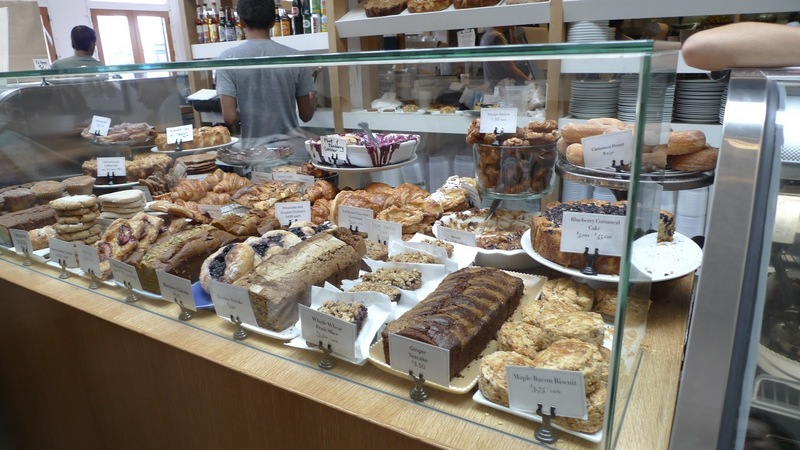 Inside, their spread of sweet and savory foods is quite broad and expansive. My eyes were bigger than my stomach, as always. Everything served at Huckleberry is made on site using the best quality ingredients, including organic flour, Vahlrona chocolate and farmer’s market produce. The menu changes regularly with the seasons is written out on a chalkboard. 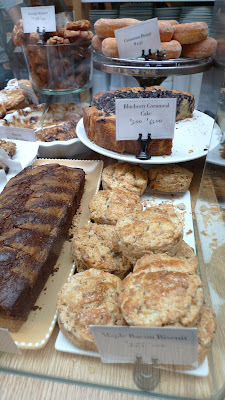 They had a wide variety of baked goods, too numerous to count. 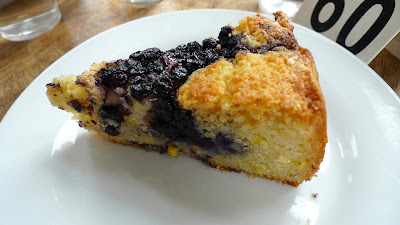 I've been on a cornbread kick lately, so this one definitely caught my eye ... a blueberry cornmeal cake. This was good, but not all that memorable. Maybe I was expecting something sweeter because of the blueberries, but it tasted more like corn bread to me. I was hoping it would be more cake-like than bread-y. One of my friends wanted to try their maple bacon biscuit. I'm a huge fan of bacon anything. I'm especially fond of this establishment. 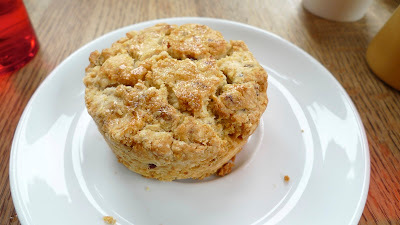 The biscuit, however, was a bit crumbly and a bit too dense for my liking. It reminds me more of a scone and perhaps if they called it that, I wouldn't have been as disappointed. I had really high hopes for their pastries especially since Zoe worked at Tartine previously, but perhaps my choices weren't representative of her talents. I'll have to go back and try some others. 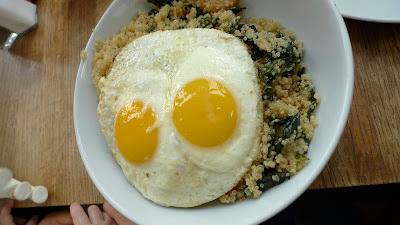 For my breakfast, I ordered the quinoa, spinach and sprouting broccoli with sunny side up eggs. This was my favorite of everything I tasted. It was hearty and totally satisfying. I really need to try this at home. 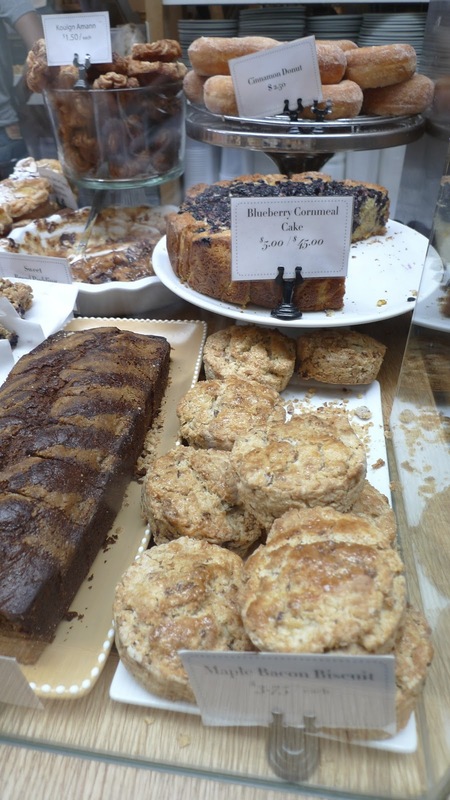 I like Huckleberry Cafe for what it is, a local bakery and cafe that serves up homemade artisan breads, morning pastries, breakfast items, soups, salads, sandwiches, rotisserie chickens and deck oven flatbread pizza. They use local farmer's market produce, free range hormone and antibiotic free meat, poultry and dairy. I think the pastries were a bit disappointing this time around, but I absolutely loved their quinoa and I love their philosophy. It can be a bit of wait, but if you happen to live near by, it's definitely worth a stop. Quinoa is a type of grain that has a high protein content. You can eat it like rice basically. They sell them at Trader Joe's and Whole Foods.